Come in, admit it, you’re not really sure exactly where Taiwan is. We’ve all heard about the country – Asus laptops, HTC smartphones anyone? – And know it has something to do with China but then a certain vagueness clouds the mind. Some facts are straightforward: Taiwan is an island, not much smaller than Switzerland in size, lying some 700km east of Hong Kong; UK citizens don’t require a visa, there are direct flights from London and frequent connections from Hong Kong can turn getting there into a short (90 minutes) excursion (or a longish one from Bangkok in three and a half hours). It is also true that the country’s scenery is surprisingly stunning and the people so considerate and friendly that Taiwan is a contender for Asia’s most welcoming destination. And, astonishingly, Taiwan’s capital is home to a museum with more priceless Chinese art treasures than any comparable museum in China itself. To cap it all, Taiwanese food is a secret surprise waiting to be discovered and the best of it is inexpensive by any standard. 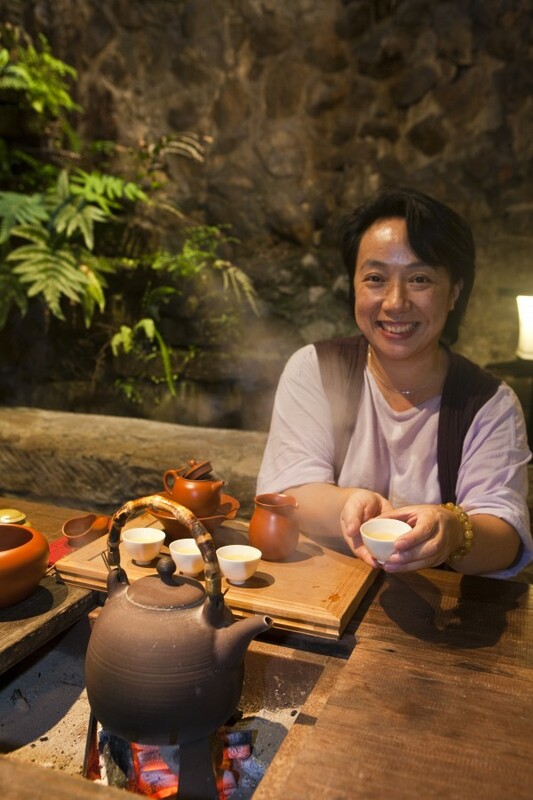 A little bit of history goes a long way in understanding Taiwan. The Japanese occupied and ruled the island for the first half of the 20th century and while undoubtedly there was exploitation there was also an injection of economic and cultural capital that paid some dividends in the long run. The momentous game changer came in 1949 when the civil war in China ended with Mao Zedong’s Red Army overpowering the anti-communist forces known as the Kuomintang. The defeated army retreated to the south and fled to the nearest large island, called Formosa at the time but now Taiwan, declaring itself the true Republic of China. This did not – and unsurprisingly still does not – please what became a world superpower with its capital in Beijing. Tiny in comparison, Taiwan has survived and prospered and, annoying China still more, developed a robust democracy. That this is not ancient history becomes aesthetically pleasurable when visiting the National Palace Museum in Taiwan’s capital, Taipei. The museum occupies a large space and it manages to mount constantly changing exhibitions, in addition to its permanent galleries, just by dipping into basements storage chambers and choosing another set of unique treasures. When the Kuomintang fled to Taiwan in 1949 they brought with them the most valuable items that had been collected by Chinese emperors over the centuries in Beijing’s Forbidden City. No wonder that the highlight on the itinerary of every tourist from mainland China is a visit to Taipei’s National Palace Museum. Daily English language tours bring to your attention exquisite jade carvings, precious silk-screen and watercolour paintings, the rarest of ceramics…too much see in just one visit. Taipei has much else for the sightseer: the architecture of the Chiang Kai-Shek Memorial Hall – monumental in size and with a slo-mo changing of the guard ceremony more watchable than the one in Whitehall – contrasts sharply with Taipei 101, the tallest building in the world until Dubai got in on the act of vertical posturing. The best way to enjoy Taipei is not being freighted to the top of Taipei 101 but walking the streets. The neighbourhood of Datong has managed to preserve traditional architecture and there are lovely old shops specialising in Chinese medicines, arts and crafts and foodstuffs you’ll not find on the shelves of Waitrose. 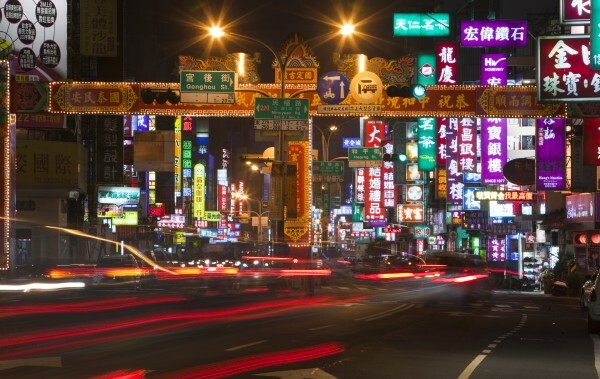 Datong is perfect for a morning’s stroll shopping for gifts and arty items for your home but when darkness falls Taipei comes alive with dazzling displays of neon and hugely enjoyable night markets. 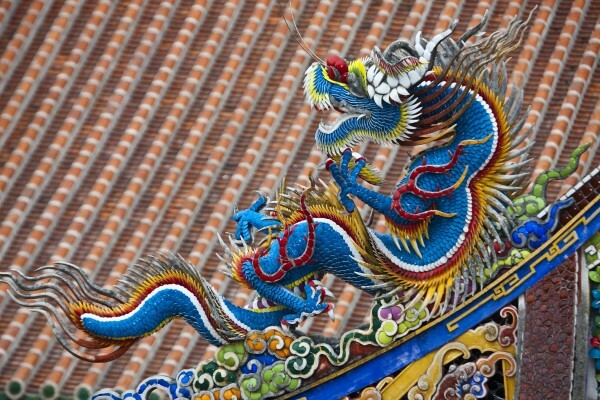 There are a number of markets to choose from but the Roache St one is recommended because it stands alongside a splendidly colourful Chinese temple. The entrance to Tzu-Yu temple is marked by pillars decorated with dragon patterns and stone statues of fierce lions while just inside stands a bronze tripod for the burning of incense to deities. Back outside on the street there is a lively and sociable night market that mixes shopping, eating and the playing of silly games like trying to puncture balloons with darts for prizes of fluffy toys. 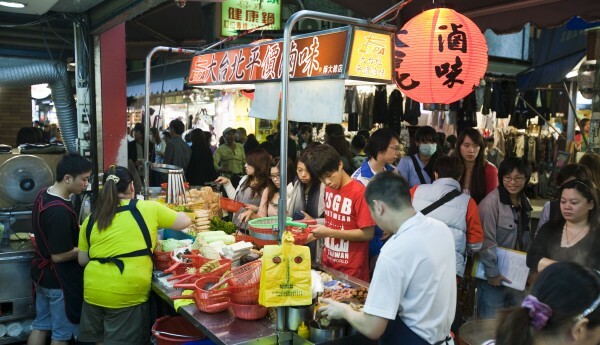 The food stalls in Roache St are scrupulously clean and offer wonderfully new tastes for jaded palates: flaky onion pancakes, pepper buns, oyster vermicelli, freshly grilled (with the help of a small blow torch) squid and, a Taipei favourite, danzi mián (a mix of pork, noodles and shrimp or egg). Don’t be put off by the smell of fermented tofu – christened smelly tofu for a reason – it’s yummy when braised and garnished with bamboo shoots and pickled cabbage and you’ll see locals queuing up for it as a takeaway. There is another snack with an unappetising name – coffin sandwich – that is made from hollowing out thick slices of bread and cramming it with seafood and an assortment of vegetables. Taipei, positioned at the top of the island with the rest of the country lying to the south, is only the start of a Taiwan adventure. It serves as the perfect introduction to a wonderful country that ought to be on every traveller’s list of places to visit that aren’t spoiled by mass tourism.